"This smooth summertime dip is great with strawberries and bananas, and may be prepared with or without strawberry daiquiri." In a medium bowl, whip together cream cheese, sugar, pina colada mix, rum and strawberry daiquiri. Chill in the refrigerator at least 3 hours before serving. Fine, but not fabulous. Don't know what is wrong exactly, just not as much flavor as we had hoped. This was awesome and easy. I used Captain Morgan's spiced rum and the flavor was superb. I will make this one again and again. 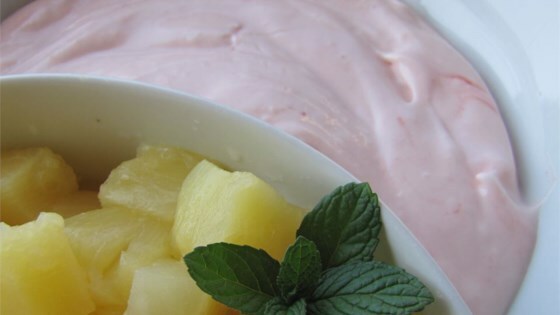 We dipped pound cake, strawberries, bananas, and pineapple in this dip. Pineapple was the BEST!! I used this for coconut shrimp, but it would go nicely with veggies or fruit as well! So easy and delicious! Makes you want to search for stuff to dip in it. Great with coconut shrimp. This was really good. A little sweet, but very good. THIS IS THE BEST FRUIT DIP I HAVE EVER TRIED! IT IS EXCELLENT ON A VARIETY OF FRUIT. THANKS FOR THE RECIPE!